Soaring temperatures could see the UK enjoy the hottest day of the year so far, as schools across the country break up for the summer holidays. Temperatures are expected to exceed 34C (93.2F) in some areas of the country on Wednesday, beating the previous high of 33C (91.4F) that was recorded in Porthmadog, North Wales on June 28. 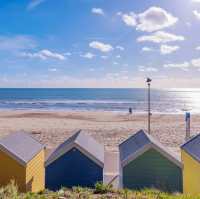 The hot weather is coinciding with the start of the school summer holidays, with millions of holidaymakers expecting to head to the coast to take advantage of the continuing heatwave conditions across the UK. Forecasters said there is a chance of temperatures hitting 34C or 35C (95F), which could put Britons in line for the hottest day since the mercury hit 34.5C (94.1F) at Heathrow on June 21, 2017. The hottest July day on record is 36.7C (98F), which was reached at Heathrow on July 1, 2015. He said: "The heat and humidity means there is a lot of energy in the air and a high risk of intense thunderstorms. Whether or not it will happen is where the uncertainty is." Nearly all parts of the UK are seeing above average temperatures, but it will be hot or very hot towards the east or south east. If you are heading off on a family holiday in the UK this summer, travel insurance can provide you with peace of mind. Get a quote for our dedicated family travel insurance and protect your family this summer.